Our guest post this month features an article by Phillip Pipkins, Marketing Representative for Dynamic Sports Construction, Inc., a national contractor for sports flooring applications. Phillip gives an inside look at the pros and cons of different basketball flooring along with providing some tips on selecting basketball shoes. Basketball was originally invented to be played inside. In late 1891, Dr. James Naismith, a physical education professor and sports instructor, was attempting to keep his gym class active on a rainy day indoors. He wanted to create an energetic and dynamic game that would not be affected during the tiresome New England winter months. Nowadays, the NBA and every other professional league uses a smooth hardwood maple surface, which gives the ball an excellent bounce. It's a much more forgiving surface on falls and your knees, and it's also easier to jump off of, so you'll be able to reach a higher point on the backboard inside than out. Hardwood is the perfect playing surface for the game. 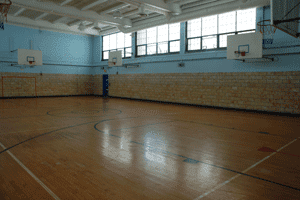 The other alternative for indoor play comes in the form of multi-surface rubberized courts. They are resilient and the tiles themselves are easy to assemble and remove. 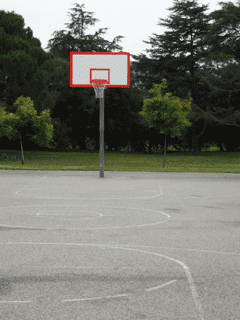 When it comes to outdoor court surfaces, concrete is the cheapest option because you can use your own driveway or simply create your own makeshift version by pouring out a slab of concrete and making sure that the area is meticulously flat and even. Although cost-effective, the surface itself leads to the most injuries: Concrete is brutally unforgiving when you fall, plus your joints absorb more impact when moving (and especially when jumping). Furthermore, a concrete surface collects a lot of dirt, dust, grit and grime, and the court can become somewhat slippery and hazardous when not properly maintained. An asphalt-based material is far more durable and creates less impact on your joints than concrete. It also offers good traction, as well as decent ball bounce. As with concrete, it's a surface that tends to accumulate a large amount of dust and dirt, so be prepared to get dirty if it is not regularly cleaned. On the other hand, multi-purpose plastic surfaces are typically the same as indoor court rubberized tile courts - they are far safer and more durable, as well as being far more lenient than concrete or asphalt on your joints. They are popular due to the generous amount of traction they give shoes, and are generally known as the best outside surface to play on. Despite what some say, the type of shoe you play with will influence your game. New shoes boast the traction on the sole you'll need, so you can get the most grip when you move. This is especially important when making lateral movements; being on defense allows you to slide your feet effectively without actually sliding on the court surface or, even worse, getting your foot caught under you as you travel. Your shoe needs to be lightweight and let your feet breathe. Shoes used to be made out of leather which, although hard-wearing, are not breathable. Currently, flywire and mesh materials provide superior levels of breathability, and offer as much durability as shoes made from leather. Your feet should feel comfortably while wearing at least two pairs of socks. Low top: Ankle support is minimal. If you play on the perimeter e.g. a guard (point guard, shooting guard), or your game revolves around shooting and making swift moves to the basket, you should be fine with low tops. They give you the most motion and are the lightest shoe available. They do, however, offer no real ankle support. Mid Top: Ankle support is medium to moderate. If you're a wing player (shooting guard or small forward) who is relied upon to score in the paint as well as the perimeter, or you are considered a high flyer (dunker) or a streaker to the basket, a shoe with more support is needed. This is because you'll have several chances to land on someone else's foot. Mid tops allow for movement of the foot and offer protection as well. Many players wear mid tops, despite the position they play. High Tops: Ankle support is at its highest. If you play in the post (power forward and center) and frequently use post moves, go for rebounds, or dunk in tight spaces, high tops are ideal for you. If you've had numerous ankle injuries, high tops are always the best option, because they offer the highest ankle support. Dynamic Sports Construction offer high quality indoor basketball court construction, athletic rubber flooring, multi-purpose sports flooring and running track surfacing for sports arenas, fitness centers, athletic facilities and many other sports floor applications. Please visit us online at Dynamic Sports Construction or, alternatively, you can call (800) 517-0015 for more information on our care and maintenance services.